Visual filter monitor with LED filter status indicator. Fillsafe diagnostic feature recognizes new filter and updates LED light back to green. The remarkable DewStop product is constantly checking the air for condensation. At the right time, DewStop will turn ON your fan and run to clear the room. Replace your existing fan switch with DewStop and your fan is now a smart fan. DewStop's sensors are always watching for harmful moisture, ready to control your fan when your family forgets to. With its built-in sensor, it constantly monitors the air for condensation and triggers the fan on to clear the room & keep it dry. Versatile-can be used in bathrooms, laundry rooms, sunrooms, spa rooms and in all condensation areas of the home. Lead Reduction Filter designed for use with Elkay EZH2O Bottle Filling Stations with visual filter monitoring. Designed to remove lead particles and chlorine. Also reduces odors and discoloration from incoming water. Features include Quick - Disconnect, 1/4 turn installation. Automatic inlet shut-off valve that closes when filter is removed. Hands never touch the actual filter media and, therefore, limit the potential for introduction of bacteria. Outer protective wrap. Spun Polypropylene pre-filter mesh to prevent large, coarse sediment and particles from entering and clogging filter media. High-grade filter is made with activated carbon and patented ATS lead-removal media. Radial flow-thru design provides more surface area for untreated water while final filter mesh prevents loose carbon from entering water. 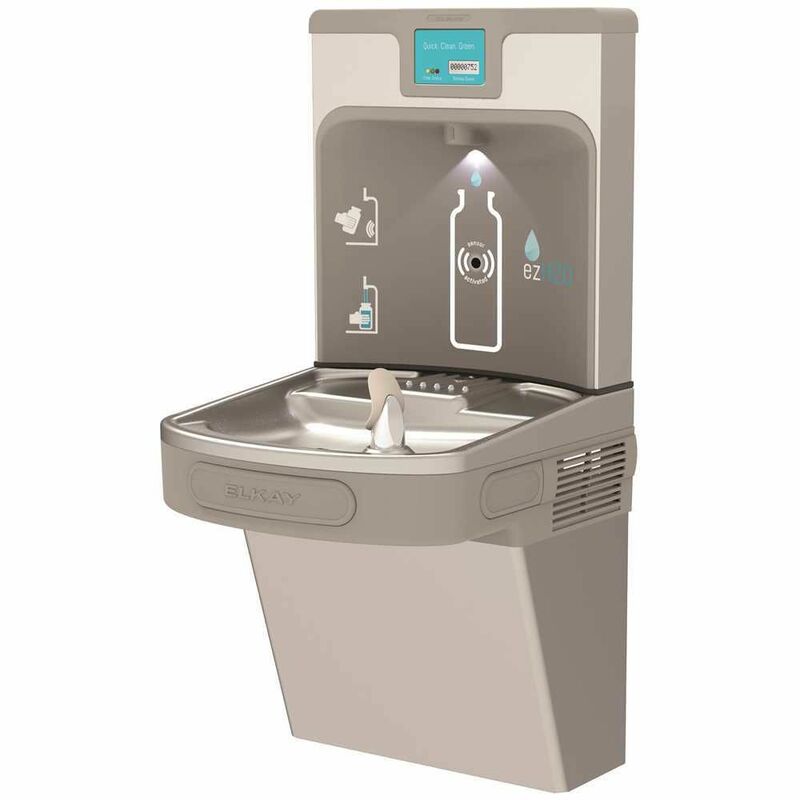 Enhanced Bottle Filling Station With Single Ada Cooler, Filtered, 8 Gph, 18-3/8 X 19 X 39-7/16 inch, Light Gray Granite The Elkay EZH2O Bottle Filling Station delivers a clean quick water bottle fill and enhances sustainability by minimizing our dependency on disposable plastic bottles. Complete cooler and bottle filling station in a consolidated space saving ADA compliant design. Integrated look combines our Green Ticker and filter status lights. Enhanced Bottle Filling Station With Single Ada Cooler, Filtered, 8 Gph, 18-3/8 X 19 X 39-7/16 inch, Light Gray Granite is rated 5.0 out of 5 by 3. Rated 5 out of 5 by Rinkrat from Everyone loves it Everyone loves it, the filter removes the chlorine taste and the cooler makes the water more refreshing! Already saved over 700 bottles in less than a month! can this be used outside? if not, can you suggest one that can?